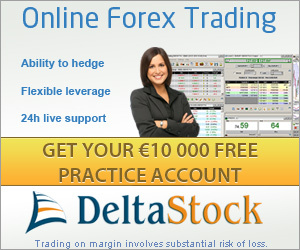 Deltastock, established in 1998 is a Forex broker having clientage that comes from over 90 countries around the world. The company has a mission for providing complete online trading solutions to the global financial markets consisting of institutional as well as individual investors. They offer integrated online trading service for both beginners and experienced traders on Delta Trading, their proprietary online trading platform and MetaTrader 4. The Financial Supervision Commission (FSC) regulates Deltastock under the EU Directive on MiFID. Deltastock is registered with the Bulgarian National Bank (BNB), and the company has maintained the highest standards in business practices. When it comes to the choice of trading platforms, Deltastock offers Delta Trading, its own proprietary trading platform and the globally dominant MetaTrader 4 platform. The PC version of Delta Trading is an advanced trading tool with a highly user-friendly interface and instinctive functionality that make it simple to use. It is also possible to take advantage of its wide range of features such as variable and fixed spreads, ten order types, sophisticated charting tools, technical indicators and real-time economic news feeds. You can trade a wide range of financial instruments within a margin ranging between 0.5% and 100%. Deltastock offers up to 20% Cashback Bonus for your first deposit made through Skrill. Your account would be credited with the fund the moment you open your Delta Trading live account. In addition, the broker would credit your account with € 1 for every € 20,000 you trade. This rebate is offered after every month. The maximum amount of rebate that you can get is 20% of your first deposit or a maximum of € 5,000 or an equivalent amount in another currency, whichever is lower. Deltastock has a full-fledged profile page on Facebook with thousands of fans, and thousands of followers for its Twitter account. Their customer support service can be reached through Live Chat, e-mail or phone. As compared to the other brokers available on the market, their chat services is one of the most reliable and fastest methods of contact. They can be contacted through phone in England, Bulgaria and Romania during daytime. Deltastock offers high quality trading services, and that they are not available in a number of countries means that traders from these countries are missing one of the best broker services. They run on several regulations, which gives confidence in their brokerage services. The wide range of choice in terms of trading platforms and the different conditions help traders to get a positive trading experience. Special Christmas forex bonus : Get 30% free Christmas forex bonus in this 2012/2013 year. This bonus offer is valid for old and for new trading accounts.